Mama can have one too. They will find my stencilled bags at the For Queen and Corgi shop at Folksy.com or buy one at the Christmas Fairs that my 'Super Stenciler' friend Sabina and I are attending. The bags are hand painted so each one is is different. Do you remember the 80's song Papa's got a brand new pig bag by Pig Bag? I can not get it out of my head since stencilling Pigs Might Fly. The flying pig stencil is a border design, a line of three flying pigs, I just messed up the formation a little. There is an all-over repeat version of this design too. Wall, curtains or ceiling of flying pigs anyone? For Queen and Corgi Jubilee Collection ends this month. When I was researching permission to use our stencil of The Queen onto hand painted bags I read that use of her image had to cease in October. I may have got that wrong but erring on the side of caution I aim to l stop painting our Vintage Queen bags at the end of this month. So, if you would like one for yourself or a gift order them now. You can order from our Folksy shop, through this blog or from the For Queen and Corgi Facebook page. Each bag is painted and stencilled to order therefore you will get something that looks like the ones in the photographs...but it will not actually be the same one. Many of our customers display the bags rather fill them with stuff but if you want to put them to work they are very hardwearing and wash well, mine has been through the wringer several times and is now incredibly soft. Prices for the limited edition, Vintage Queen bags are £31.00 or £45.00 if you would like it embellished with a dozen Swarovski crystals. The other Jubilee inspired designs cost £28.00 for the queen in profile and £26.00 for the crown design, they are also made to order so colours can be requested. It's your last chance to bag one! PS. If you would like to learn how to stencil fabric we are running a stencil class this October. The Olympic Torch just passed through our village. I stencilled a bag to commemorate the day. Stocksfield high fives pic from Northumberland.gov.uk. The stencilled butterflies that stood so proud at the Jubilee celebration attempted a soggy, patriotic welcome as George Nicholson from Durham ran through the lower part of the village of Stocksfield ferrying the torch on it's journey to the Olympic Stadium in London. He and three other runners that carried the torch through Stocksfield is one of the special 8000 torch bearers chosen from all regions of the UK and for the few minutes that he approached and passed the rain ceased and the sun was kind to him. Many people admired by stencilled bag and asked where to buy them. I had missed a sales opportunity and should have had a barrow of them! I had made two more for the window of the local cafe so sent people there. If there were no bags to buy at least they would get hot coffee and cakes. Late last night I stencilled two pinboards. I was on a deadline to finish one for our village's Portrait of The Queen Exhibition. I thought I would make my portrait useful. and the other without. I liked the industrial look of the plain frame but friends preferred the contrast so I repainted it, what is your verdict? They are prototypes for a new collection created for For Queen and Corgi. They started life as a plain cork pin board from IKEA. Very soon I shall post a project on stencilling an IKEA pinboard. 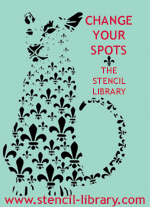 I used our SIB14-S Dogs stencil from the Stencil It book. Tomorrow I will visit the Portrait of The Queen exhibition in Stocksfield. I'm dying to show you what my For Queen and Corgi partner Sabina painted. For Queen and Corgi now has a Facebook page, we have had some lovely press recently and you will find it there.